The life of a Molosser judge in the 1970s and '80s was so much easier. 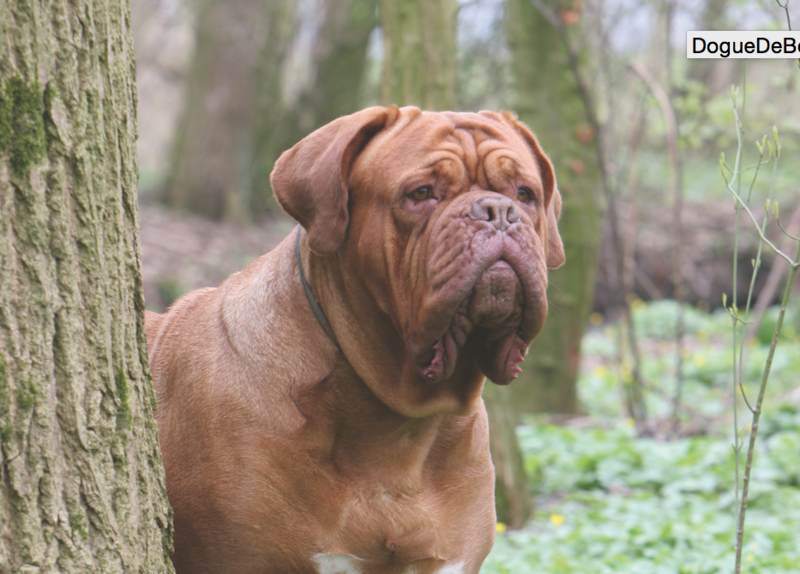 Breeds like the Bullmastiff and Mastiff were well established, in the U.K. and U.S. at least, and the Dogue de Bordeaux and Neapolitan Mastiff were ready to take on the world. The best dogs were very typey specimens of their breed. No hypertype, no health issues as a result, no criticism from outside or inside the dog game. Changes to standards because of this? Unheard of. Nice intro, but a bit of a caricature. The Mastiff in those days was suffering from unsoundness and shyness, and was in a constant battle with influences of outcrosses. In Dogues de Bordeaux you could easily spot dogs that would have been better off in the Bullmastiff ring and carried tributes to their Mastiff, Saint Bernard or Bulldog heritage. Typical Neapolitan Mastiffs were seen first and foremost in blue, their newest color, and there were plenty that looked “different.” The best of them were strongly built and sound as a bell but lacked breed type; today they would be called Cane Corsos. Again, unsoundness in the “true to type” Neos was an issue, for sure. The Bullmastiff, more strongly established compared to the other three – and forgetting the Dogue de Bordeaux lookalikes and the odd throwback to the Mastiff or Bulldog – hardly suffered as much from unsoundness, but still there were modern tendencies of hypertype and related health issues that needed to be watched. Nonetheless, two, three decades ago, the world of these four Molosser breeds was a more “well-organized” one. To better understand the nuances of why, it’s probably the best if I focus on one breed characteristic only: wrinkles. In all four breeds, wrinkling is an important to extremely important part of type, depending on the breed. There are vital differences between the four when talking about wrinkles, and those differences highlight what is true-to-type in each. If you really want to understand a given breed, you have to study its close relations as well, certainly when as much interbreeding has taken place as in these four. A true-to-type Bullmastiff needs hardly any wrinkle. Unlike the other three breeds that follow, a typey Bullmastiff needs hardly any wrinkle. It is the finishing touch on the Bullmastiff as the most athletic and active of them all, clean cut, dry and hard muscled. 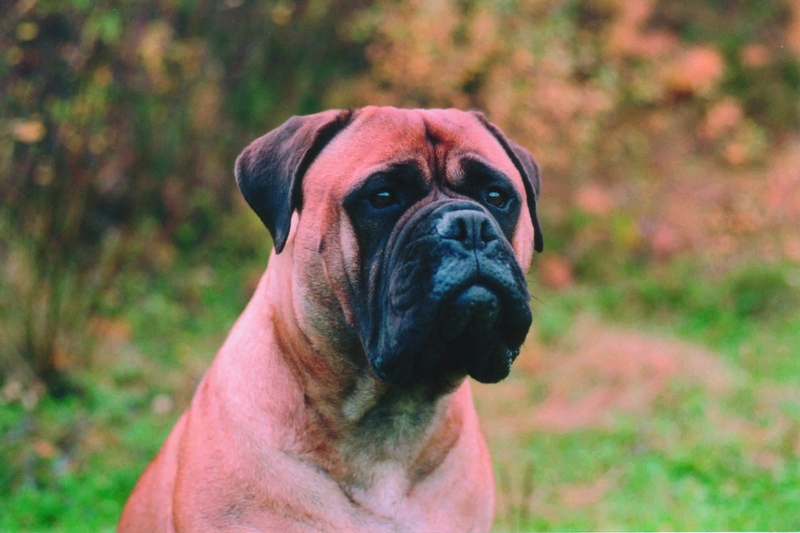 Dewlap, an important characteristic in the three breeds to come and almost always going together with wrinkles in whatever wrinkly breed, is not wished for in a Bullmastiff. It is not even mentioned in the standard, meaning it should not be there. There is another restriction to be found, in both standards, regarding the lips: “Flews not pendulous, never hanging below level of lower jaw.” That is how dry this breed should be, except for a bit on the head. Not more than a bit, as that would easily detract from the squareness of the head in a breed that should have the squarest head of them all. An important part of the square Bullmastiff skull is that extra development of cheek, not seen in any other Molosser. Too much wrinkling, especially there, hides the dry squareness and gives a less alert, not to say sweet, expression; a Bullmastiff, however sweet and gentle in character, should look the opposite. A Bullmastiff with too much wrinkle can easily approximate a Dogue de Bordeaux – his French nephew, brother even. In other words, a Dogue de Bordeaux should have more wrinkle than a Bullmastiff. 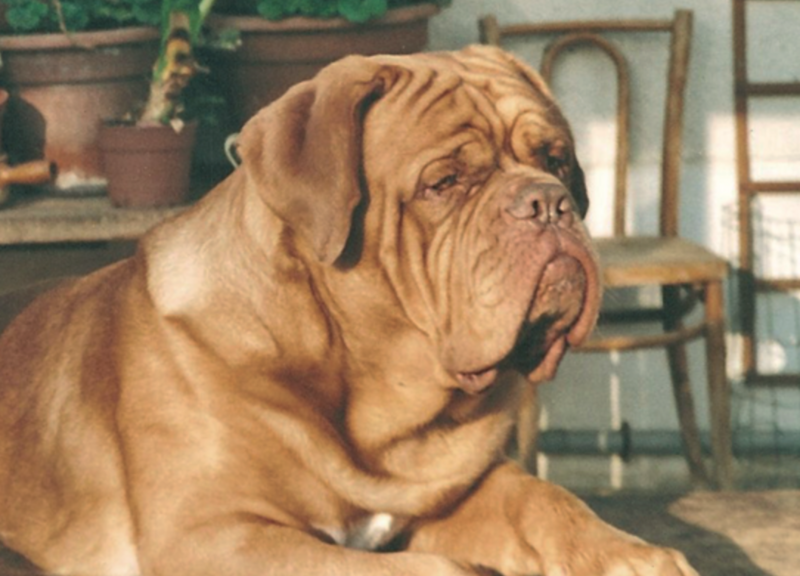 According to the French mother club, the Societe des Amateurs de Dogue de Bordeaux (SADB), wrinkles were becoming part of a hypertype problem that had to be stopped. It must have surprised many how quickly action was taken to change the FCI standard, updated January 23, 2009. As a result, the AKC standard, clearly “inspired” by the FCI one, is now slightly outdated, at least in those parts where some fine-tuning has taken place so that there can be no misunderstanding between standard and overtype. I must say I was surprised by the promptness of the French reaction, but even more surprised by the careful wording that improved the original standard to stop a movement toward “the more, the better” – a seldom-heard sentiment in the dog game, is it not, that a change to the standard is a welcome improvement? The old FCI standard said: “The head is furrowed with symmetrical wrinkles, each side of the median groove. These deep ropes of wrinkle are mobile depending on whether the dog is attentive or not.” Here you have that the Dogue should have more wrinkles than the Bullmastiff – deep ropes that should always be there, as long as they are mobile. The AKC standard is identical as far as these quotes go. The beginning of that standard dictates: “Serious expression” Why? Because it is difficult for a Dogue to look serious without wrinkles. It becomes plain, mean, harsh or – depending on the rest of the head characteristics – not Dogue de Bordeaux. That is how essential wrinkles are in this breed. Plenty of wrinkles, but no doubt that they are mobile. Look at the deep stop of the Dogue de Bordeaux (the deepest of the four breeds mentioned); see how developed the eyebrows are in this breed (the strongest of the four), and see how the facial wrinkles of the Dogue accentuate, drape them almost. Together with the chin mark and slightly higher nose placement, it gives the Dogue de Bordeaux, the French sour mug, its unique face and expression. If the Dogue de Bordeaux is the most pronounced in breed characteristics of the four – it is not for nothing that I like to describe him as a (Bull) Mastiff going in the direction of a Bulldog – then the Mastiff is the least pronounced of them, and his wrinkles are an integral part of it, though they can easily become too much. From my first days on the Mastiff scene in the late ’70s, wrinkles weren’t an issue. There were so many other things to worry about, like type and soundness and temperament, that a true breed enthusiast would look silly to complain about wrinkles – a matter of priorities, and rightly so. And if there was something to moan about then, it was the lack of wrinkles, not an excess of them. When talking about head type, the endless battle was changing the narrow, long head without enough stop. Any Mastiff that showed the desired strength, especially of stop and muzzle, was embraced, however wrinkly he was. I think that might have played an important part in the 1980s and ’90s: The Mastiffs that excelled in those elusive head qualities were often not that “clean.” Another factor, only in the last decade or so, is the global influence of the American-bred Mastiff. The AKC standard allows more in terms of wrinkles than the FCI standard (based on the KC one) does, no doubt there. What has not helped either is that Mastiff fanciers in general like wrinkles in their dogs, another variation on “the more the better” theme. Today’s Mastiff enthusiast does not stand alone in this, I hasten to add; it seems to be a modern “disease” in Molosser fanciers. The result of it all is that there are too many Mastiffs with too much wrinkle, so much that they would be better off in the Neapolitan Mastiffs ring. The FCI Mastiff standard – the changes of the newest KC standard have not been implemented yet, but they will be – says: “… forehead flat, but wrinkled when excited.” That is it. What that means in terms of amount, please have a look at the Bullmastiff paragraph, but not too long, as the expression of the two is quite different, to say the least. As long as you take this with you: It can easily become too much. 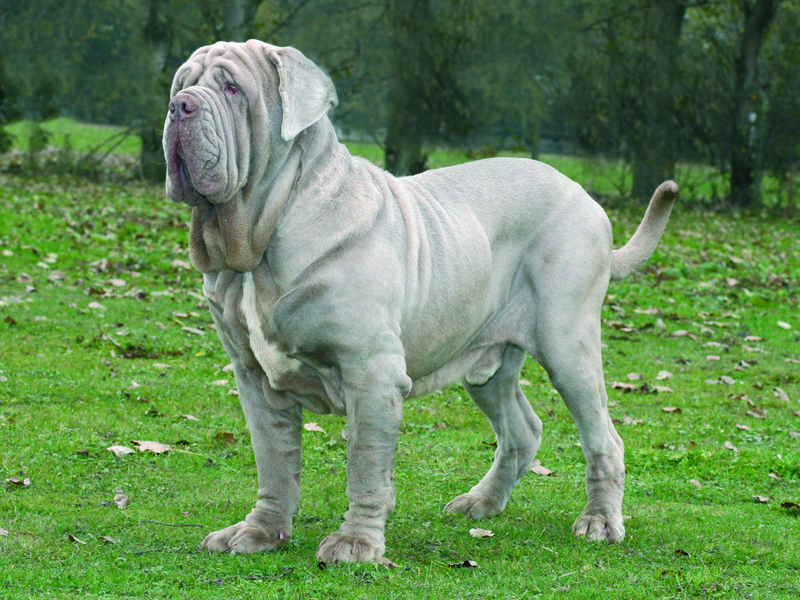 The AKC standard gives a different message, though: “Showing marked wrinkles which are particularly distinctive when at attention.” Different for sure, but both standards make very clear that haw is not to be tolerated, a quality that often is the result of too much and or too heavy skin, so there are limitations in the American standard, too. More restrictions are to be found when one looks for the official requirement on expression. 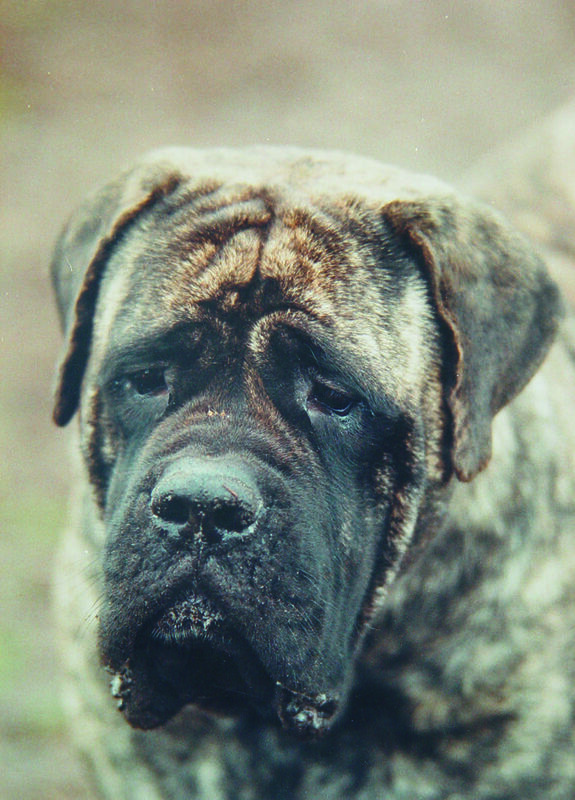 In the FCI standard you will find nothing about it, but the AKC one dictates: “Alert but kindly.” It is a vital extra the AKC gives here (in many breeds it proves to be so important to consult both standards to get the most complete picture of the breed), as it says no to Hound or Neo type in Mastiffs – no sad expression, in other words. Are you still there? Forget about the Latin; that is for yet another lecture, not mine, though. The way I think it should be interpreted is: Here you have a skull with the most moderate characteristics compared to the other three breeds focused on in this article, with not one part of it really coming to you. Unique for the Mastiff is that his skull in repose looks quite different from the skull in full attention. When alerted the forehead gets a flattened appearance, from above the eyes right to the top, and the furrow becomes clearly visible. Both qualities are accentuated by the right amount of wrinkle, as if they say: Look how flat this skull is and see how far this furrow goes up – all very Mastiff like. 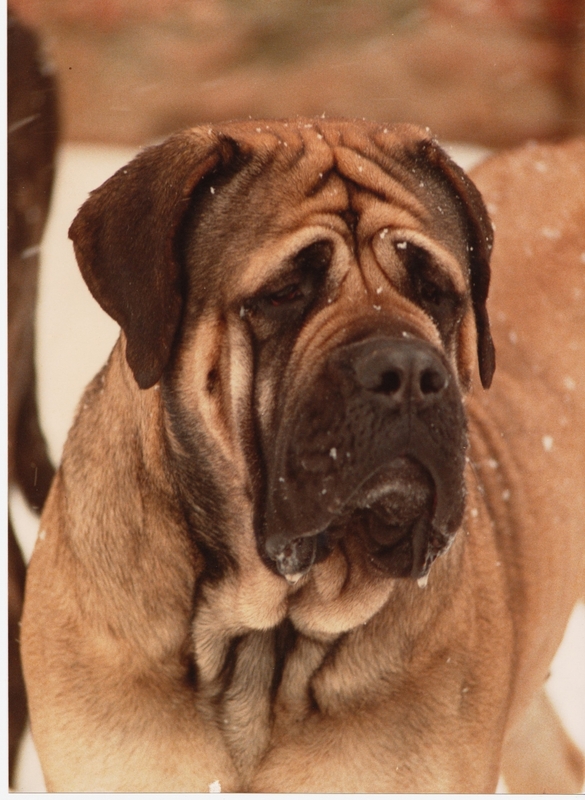 The wrinkle that might be there, which is not essential for true Mastiff type, the one mentioned before, starting just above the eye, helps give the head its characteristic gentle look. In this respect, wrinkles and correct head structure beneath are a nice blend, resulting in the most “modest,” may I say most “chic” expression of the four, head structure in which all possible room is given for the eyes to do their work – no distractions of too strong a brow, stop, cheek, chin, nose placement, not even wrinkles. As soon as elements other than eyes ask for more attention of the viewer, there is something wrong in a Mastiff head. That is why the Mastiff suffers the most from the influences of other breeds; Mastiff type is quite delicate, to say the least. In principle it is an apt description of the Neapolitan Mastiff, and I can understand how the AKC came up with it, taking into consideration how the average champion in Europe looked when the Neo was officially recognized in the U.S. Quite an evolution took place – revolution is a better word, perhaps – before the breed was embraced in the States. A revolution spurred by the aim of “the more the better,” forgetting vital characterisctics that are in the FCI standard, as well as in the AKC one. The wrinkle that starts above the eye is essential for Neapolitan Mastiff type. In other words, even Neapolitan Mastiff type has its restrictions. A fancier should not have to go to a vet to have his Neo be operated around his eyes, once, twice or more. When focusing on expression only, the AKC standard rightfully requires an expression that is “intimidating when alert,” with a “penetrating stare.” How can that be found in a head when the eyes can hardly be located anymore? And, more generally, how “majestic” (according to the AKC and FCI standards) and “noble” (FCI standard) is a Mastino Napoletano who does not have the foundation – bone, ligaments, muscles, condition – to carry all those extra-rich attributes? Here is my frustration in full swing, first and foremost a symptom of how much I adore this breed. 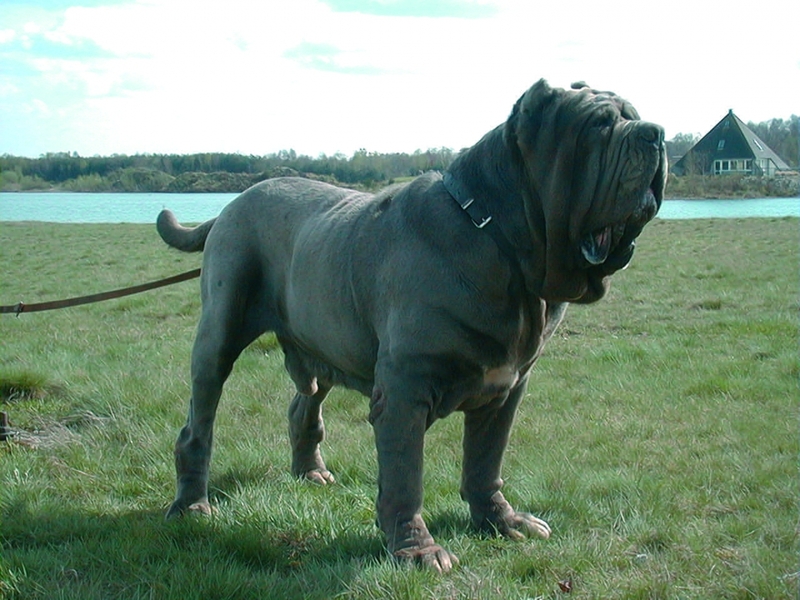 For me personally it is difficult to be more impressed by any breed as much a Neapolitan Mastiff, and luckily there are still Neos all over the world that touch me because of that rare combination of qualities. (I must say that the American Neos I have seen on videos of Westminster and in ads in this magazine make me very enthusiastic about the state of the breed there – plenty of type without being overdone, on strong and well-built bodies.) But I have come across simply too many that made me really sad. This cry out loud should not be interpreted as me wishing for other than the standard type. When talking about skin, I am a true follower of what the FCI standard dictates: “Thick, abundant, and loose all over body, particularly on the head where it forms numerous folds and wrinkles, and at the lower part of the neck where it forms a double dewlap.” And when reading about the head I take in with all pleasure: “ … Ample skin with wrinkles and folds of which the most typical and the best marked goes from the outer palpebral angle down to the lip angle.” Both quotes give restrictions: Too many Neos have so much dewlap that the left and right part cannot be differentiated, and show so much wrinkle all over the head that the one wrinkle that stamps Mastino type as no other does – the outer edge of the eye – becomes just one of many. Maximum of type — read: wrinkles, lips and dewlap. Why more? Another restriction according to the FCI standard: “Eyes: rather round, slightly deep set.” Yet another reason to say enough is enough to wrinkles on the head is that too much loose and/or too thick skin will at least detract from that other essential breed characteristic of the head and that is parallel lines. Enough evidence to say, even in a Neapolitan Mastiff, enough is enough? I sincerely hope so, first for the benefit of the dogs themselves, and second to emphasize what that overall impression of “majestic” really means for the various points around skin. In a way, going back in time is the answer to change what has gone wrong in all four breeds that have been focused on here. There are still quite a few breeders and judges around who have been in the breed(s) for several decades who would love to share their knowledge, and there are plenty of photos of dogs gone by that make the search for the outstanding dogs of “all time” none too difficult. It will help any keen breed enthusiast to interpret the standard the way it should, coming to the conclusion that the best dogs of that “golden era” of the 1970s and ’80s were the ones that were really appreciated as “in the middle of the standard,” ticking all essential boxes without being overdone in any way – true-to-type. And it is the only way to stop criticism – or worse – against so-called unhealthy breeds. What about the “happy ending”? If the previous paragraph is not enough to give you, breeders and judges alike, a boost of “let’s go for it, it will work,” then have a look at the Shar Pei, Chow Chow or Bulldog. There you can see what can be achieved in a very short period of time, from too many unsound, hypertypical dogs to plenty of dogs around that at least are not suffering anymore from their breed characteristics, excessive skin first and foremost. It should not be difficult to achieve the same in a relatively short period of time in our Molossers too. I personally have every faith that wrinkles will be a different topic soon. Focus, listen, read, compare and put into practice, that is all. After that: Happily ever after. Regarding wrinkles, at least.